Your Morning Cup: Week 35--Closing Week! 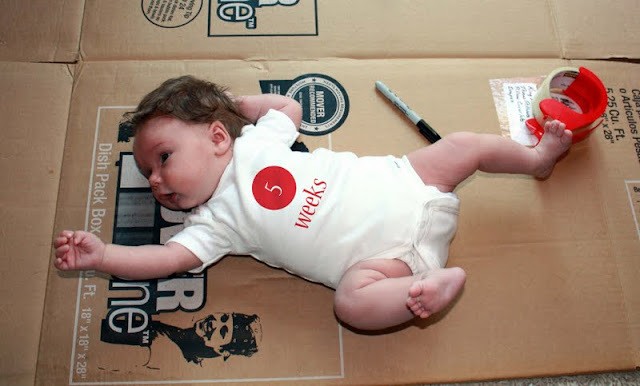 It was exactly 30 weeks ago today that I posted the picture of Tatum on a cardboard box as we prepared for our cross-country move. Tatum is getting a bit more mobile every day, even though she's technically not crawling yet. She scoots, slides, rolls and inches her way towards where she wants to go. That's all the time for now--got to go work to make some money while the Tot is down for a nap (well...almost down...)! Oh Tatum!!!! <3 She looks so much like you, well the both of you. At 5 weeks, she looked like Matt's twin.